hey guys! its been a while since ive been on! well,today,i got a sun conure.my brother named him buddy,but im not sure how long thats going to last.he's a weird bird. he's an angel one moment,but literally 5 seconds later,hell be trying to kill you.ill try to get pics up soon. hes a little shy. ive got a fever,and the only cure for it is more cowbell.I NEED MORE COWBELL! Hey Chirps! Yes, it has been awhile. I trust you have been studying hard? Congratulations on getting a sun conure! They are a beautiful bird. Sunnies are so pretty and very intelligent. Congrats on your new addition. Congrats on the sun conure, chirperfan! Hope all goes well and he settles in quickly. 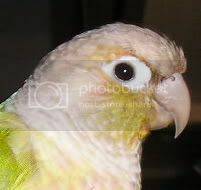 My green cheek conure, Jasper, is a angel most of the time, but I'm learning to read his moods. Sometimes he's just not in the mood to snuggle and would rather be crazy and attack things. When he's like that it isn't wise to try and snuggle, because anything shiny will set him off. Can’t wait to see the pics. Hope he settles in soon, sure with a little work it will be a wonderful little caricature. i read somewhere that you shouldnt be able to see your birds ear holes,but i can see buddy's really well after he takes a bath and a little bit when hes dry. is this a problem? You probably shouldn't be able to see them very often when they're DRY, but when the feathers are all soaked and clumped together, they can be quite noticeable. I see my conure's ear holes every time he takes a bath, and the little guy can hear a pin drop outside the door when he's sleeping in another room. ok.thanks. i had just never seen my other conures ear holes before and i thought something might have been wrong. Yeah, it took me a little while to notice where my green cheek's ear holes are, and I was a little surprised when I first spotted them. Now that I know where they are, I see them everytime he has a bath. So maybe you just didn't take notice before? And sun conures like yours are a little bigger, of course, so it'd be even easier to notice them.